Super cute, über diverse, whimsical fun. The pastel, fluffy, round art fit the writing perfectly. 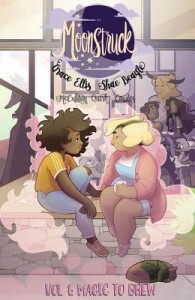 A sweet story that centers on self acceptance that's complete with magic, monsters, and cute lesbian werewolves. Perfect for tweens, teens, and young at heart adults.